Narayanan and Wanchoo are governors of Bengal and Goa respectively, and thus, enjoy legal immunity. CBI has written to Ministry of Law and justice seeking their views whether former SPG chief B V Wanchoo and former National Security Advisor M K Narayanan can be examined in connection with the scam. 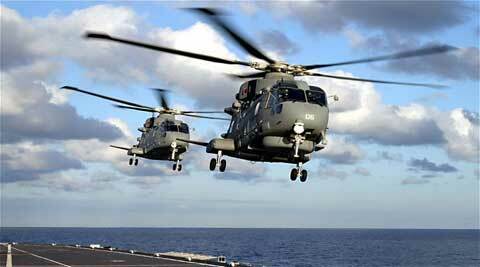 The heat of the probe into the alleged payment of kickbacks in the Rs 3,546 crore VVIP helicopter deal reached the doorsteps of former SPG chief B V Wanchoo and former national security advisor M K Narayanan with the CBI asking the law ministry if it can question the two in connection with the case. Narayanan and Wanchoo are both governors – of West Bengal and Goa respectively – and enjoy legal immunity. The agency will need the approval of the President to record their statement. The CBI wrote to the ministry a few days back and annexed documents which are believed to have been cleared by Wanchoo and Narayanan in connection with the purchase of the choppers for the IAF meant to fly VVIPs such as the President and the Prime Minister from Anglo-Italian firm AgustaWestland. With the ministry yet to revert, CBI sources said they would soon send a reminder. They also said that if the law ministry agrees to suggestions made by the CBI, the agency would not need the President’s clearance to record the statements of the two governors. Earlier this month, the government terminated the deal for 12 choppers on the grounds that AgustaWestland had breached the integrity pact by allegedly paying kickbacks. CBI sources claimed Narayanan as NSA and Wanchoo as SPG chief had cleared reducing the service ceiling specification to 4,500 feet from 6,000 feet, allowing AgustaWestland to enter the race for the deal. The two are said to have participated in meetings that deliberated on the reduction of the operation requirement in order to avoid a situation where only one vendor would be in the race. The agency said it wanted to examine the two to understand how the operation requirement was reduced and who gave the final nod. CBI sources claimed that the IAF was initially against reducing the operation requirement at meetings where Narayanan and Wanchoo were present. But the Air Force is said to have changed its stand after the then IAF chief S P Tyagi agreed with them to change the height ceiling. Tyagi, the sources said, had blamed Wanchoo and Narayanan for the decision when questioned. The CBI case names Tyagi and three of his cousins and accused the former chief of facilitating the deal for AgustaWestland.